Don’t you deserve to experience true luxury in your backyard? Discover how custom features can make all the difference. Aqua-Tech’s talented, skilled team offers you the unique chance to own an incredible, custom designed swimming pool. Discover how our bespoke design options will create a better place to come home to. 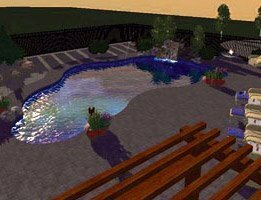 Your family and your home are completely unique: why should your swimming pool be just like any other? When you choose an Aqua-Tech pool, you’ll find that we’re the best and most experienced choice in Winnipeg to craft your perfect pool, complete with all of the customizations that will make it a gathering place for your family and friends for years to come. Did you know that your pool can include colourful lighting you’re able to control at the touch of a button? What about waterfalls, cleverly camouflaged slides and diving boards? Your pool design can incorporate any of these options and more–even sunken a hot tub or swim-up bar could be yours! Your custom swimming pool design begins with your consultation with a member of our exceptional and accomplished design team. You’ll be paired with a designer whose style matches yours, and as you work together you’ll see your dreams will come to life before your eyes. Each member of the team is capable of creating remarkable and innovative designs that capture all of your requirements, opening up a world of possibilities that you didn’t even know were available. We would like to thank Aqua-Tech for the excellent service provided to us during the planning and installation of our in-ground pool last summer. It has been a year and we are very impressed with quality of product and service that Aqua-Tech provides to its customers. It would be impossible for us to highlight every single option you’ll be able to choose from when you select an Aqua-Tech pool, and as an award-winning team with over three decades of experience, you can trust that we’ll build you a better place to come home to. If you have a vision in mind for an aspect of your pool but haven’t seen it executed, simply speak to our team. Our talented team loves being challenged to bring your ideas to life! Call today to arrange your complementary consultation.